Roof replacement is entirely different from roof repairs. Unfortunately, it’s easy to assume that just replacing a couple of shingles or fixing leaks require the same skills given the similarities. 1. You’ll get more value for the materials. The cost of materials will be the same whether you buy the roofing materials yourself or hire a contractor. Chances are you’d make mistakes during installation, and likely end up hiring professionals to fix them. You’ll also have to buy specialty tools. Why would you spend money on tools that you’d only use once? 2. Professionals take safety precautions and have insurance. Additionally, you’ll have to use safety gear. As one of the top White Plains roofing contractors, we ensure that our team wears the proper safety gear, and have insurance in the event of a mishap. We’re sure your insurance has the same coverage, but you risk leaving your roof unfinished while you recover. 3. Professional roofers have experience and training. Professional roofers have the experience and training to ensure that the roofing in Fairfield, CT, is installed correctly. Remember that many types of roofing material have to be installed in a specific way, and with specific tools and techniques. 4. Professionals can perform a detailed roof inspection. Another benefit of experience is knowing what to look for. Professional roofers can spot signs that would determine if your roof deck will need repairs. These are signs that you would have otherwise overlooked. 5. It might take a lot longer. Professional roofers have to stick to a timetable, which is why they would send additional workers if needed. We believe that finishing a roofing project on time is essential, especially during the rainy season. Installing an entire roof by yourself would take much longer. 6. The warranty is much better. Most roofing materials have manufacturer warranties, but that’s about as far as it goes. If a problem arises from improperly installed material, you’re on your own. Top manufacturers like GAF offer warranties that extend to the workmanship, but only if the material is installed by certified contractors. Some roofing contractors even offer special warranties. In fact, Vinylume offers a Triple Protection Warranty that goes on top of our manufacturer warranties. 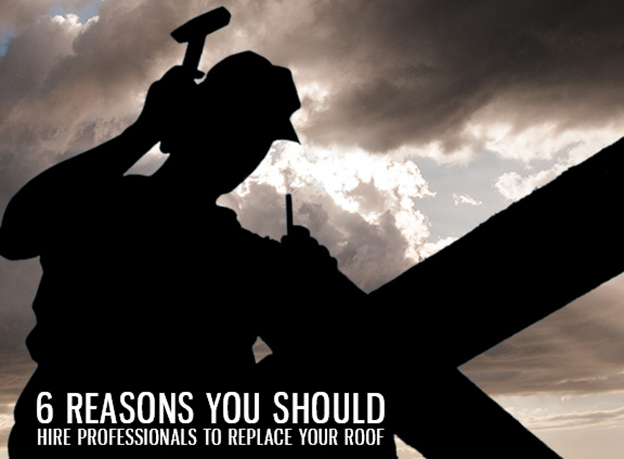 If you want to know more about the benefits of a professionally installed roof, call us now at (866) 244-8029. You may also fill out our form to get started.